The MX series of compact manure spreaders from Wallenstein are ground + PTO driven manure spreaders, ideal for keeping stables clean and making the most out of nature’s bounty. They are the best way to control your pasture, with the minimum amount of odour due to the fine shredding process. 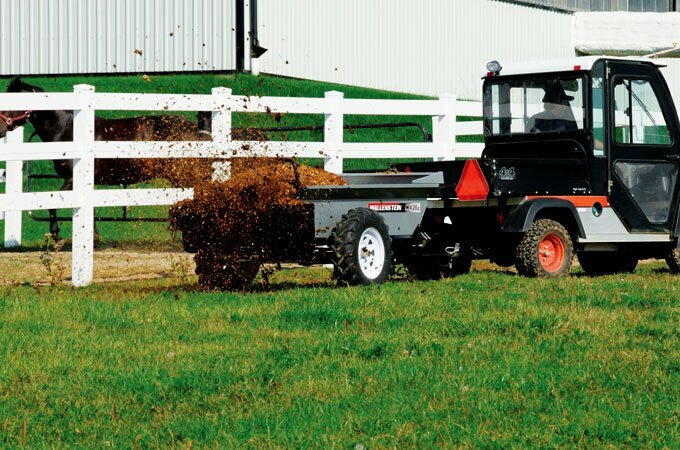 Designed for ease of use in equine facilities and hobby farms, MX spreaders are the perfect size to handle manure from barn to field without making a mess. All Wallenstein manure spreader have three levels of unloading (spreading) speed affecting the apron chain (these are the only spreaders on the market which do so). A few moments is all it takes to get the right coverage for your application requirements. The heavy duty apron chain can increase or decrease to maximise manure spread and all Wallentstein spreaders are focused on providing an even spread pattern as the beater panels break up and distribute the manure evenly across the ground in small pieces. This fine shred pattern makes it easier for the manure to be absorbed into the ground and avoids large clumps from damaging the grass. MX25G from the MX series of manure spreaders. 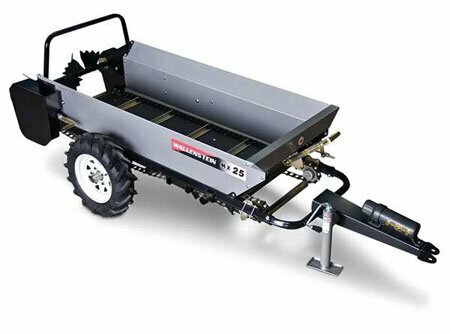 These compact manure spreaders come at an affordable price and have a one piece welded bed frame for durability, made from tubular steel. The frame, not the box, handles the weight load and pulling force. Frames start with a strong foundation and are built up using sturdy, heavy gauge steel construction, finished with a baked on powder coating to prevent rust. Unlike metal and wood, a Poly-Floor (industrial grade plastic) board that is resistant to weather is used, extending the life of your spreader. Poly-Floor will not rust or rot and is flexible. Our MX spreaders are available as ground driven models (for where a PTO does not exist).